We would be grateful for any old photographs of Preston Dock. 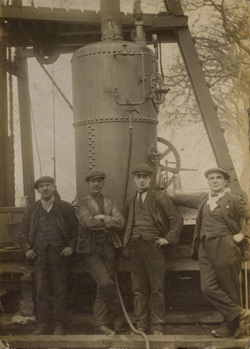 Here is a very old photo of my grandfather and his workmates on Preston Dock. He is 2nd from the left. I do not know the date when it was taken, but it must have been around about 1920, I would guess. My grandfather was John Harrison, born 1897 who lived in Wellington Road, Preston and who worked for 50 years & 4 months on Preston Dock, retiring in 1962 as Foreman in the Works Superintendent's Dept. 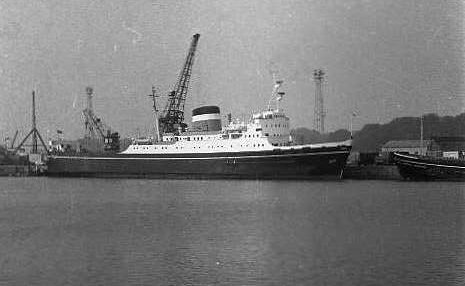 Although never a major port, Preston pioneered roll on roll off ferry transport. Albert Edward Dock opened in 1892 - at that time it was the largest single dock in the country. In 1948 the dock was the first to introduce roll on roll off traffic. By the 1960s the port held the record for the handling the largest amount of container and ferry traffic. Traffic reached a peak in 1968, when 500 dockers were employed and 1,437,000 tons of unit load trade passed through the port (16% of the UK total). Cotton and wood pulp were the most important cargoes landed here. As the size of ships increased, fewer could use the dock. At the same time, the import of traditional cargoes decreased, and the cost of dredging silt from the channel increased. 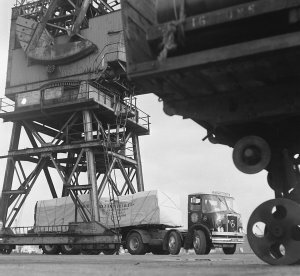 The early post-war advantage of being the pioneer in roll on roll off operations was lost to competing ports which could offer faster turn round time. In the 90 year history of the port, it only made a profit in 17 years. In 1979 the decision was made to redevelop the site. Many thanks to Paul Dawson for providing information about the docks. His father was a river pilot, his mother worked for Northern Ireland Ferries and his grandfather, who also worked worked at the port, wrote an autobiography, "Preston Port Revisited." The docks are now home to pleasure craft, and the surrounding waterside areas house a retail park, multiplex cinema, housing, offices and light industrial units. Text taken from web site by Graham Dean. Technical problems? Callout service for Home and Business.